C1 Schroth course with Dr. Rigo. FITS Method from Poland offered for the first time in Miami. SRS Position Statement on "Screening for the early detection of idiopathic scoliosis in adolescents." Recent Research Supporting Schroth Therapy for Scoliosis: a Randomized controlled Study. Scoliosis Research Society Supporting the Schroth Method as nonoperative treatment for Scoliosis. Great news about Schroth for scoliosis treatment in the New York Times. Simply getting to the core. Welcome to CorpoSchema Pilates & Rehab - "CorpoSchema" is a privately owned physical therapy practice and pilates studio located in the City of Coral Gables. In 2012, CorpoSchema became the first physical therapy practice in town to specialize in the conservative treatment of spinal deformities following the Schroth Method. CorpoSchema is an out-of-network provider for most insurance companies, allowing one-on-one quality care at reduced private pay fee. Its owner, Beatriz Rodriguez, brings over 15 years of experience as a physical therapist and over 7 years of experience as a Schroth therapist while dedicating one-on-one quality care to each person. Spinal rehabilitation mainly utilizing specific exercises, manual therapy, and postural re-education for a variety of conditions, including but not limited to osteoporosis, spinal stenosis, degenerative disc disease, disc herniations, fractures, back strains or sprains. Post-surgical spinal rehabilitation after healing is complete, utilizing specific exercises and following Schroth principles with modifications to address the trunk imbalances above and below the fusion, thereby maximizing symmetrical forces in the spine. Pilates-based rehabilitation for spinal pain wihout scoliosis, pre and post pregnancy, overuse injuries, and sport injuries. For any specific questions about our programs, scheduling, payments, please fill out our inquiry form, and a physical therapist will respond within 24 hours. 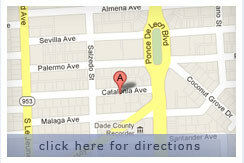 You may also call us directly at 305-428-2790, leaving us a detailed message if we are unable to answer your call. The International Society on Scoliosis Orthopaedic and Rehabilitation Treatment (SOSORT) brings together scientists, physicians, and clinicians focused on the conservative treatment of spinal deformities. Conferences are held in the American continent every 3 years and in Europe otherwise, representatives from over 40 countries usually attend. SOSORT has produced consensus statements on key topics including: bracing, exercises, and reasons for justifying treatment.